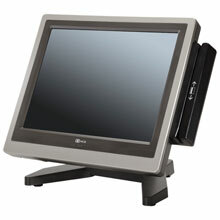 A POS terminal with superior value and a versatile design. The NCR RealPOS 25 features a slim all-in-one design, an intuitive touchscreen interface and flexible mounting options that enable placement on a counter, pole, bracket or wall. Featuring a rugged enclosure, long-life LED display and fanless operation to increase reliability, while also also providing an efficient serviceability with quick access to internal components, intuitive cable routing and diagnostic indicators. With its flexible design, robust performance and long lifespan the RealPOS 25 delivers a low total cost of ownership to maximize your point-of-sale (POS) investment. The NCR 7610m4 is also known as NCR-761010008801	.